Portrait of Charles-Augustin de Coulomb. Charles-Augustin de Coulomb (June 14, 1736 – August 23, 1806), a French engineer and physicist, discovered the relationship between the force that exists between two electrically charged bodies and the distance that separates them, known as Coulomb's Law. He also studied frictional forces, and used an advanced mathematical technique called the variational calculus to analyze the forces on materials used in construction. Coulomb was born in Angoulême, France. He was the son of Henry Coulomb and Catherine Bajet, both of whose families were situated in the higher strata of French society. While still quite young, Coulomb's family moved to Paris, where he received instruction in the arts and sciences at the College Mazarin. Coulomb and his father moved to Montpellier after his father suffered a financial setback. During this time, Coulomb submitted some of his first work to the Society of Sciences in that city. He returned to Paris for tutoring, and passed the exams necessary for his entry to the Ecole du Genie in the town of Mezieres in 1760. After graduating in 1761, he assumed the position of lieutenant in the French army as a military engineer. His first major project was to strengthen fortifications on the island of Martinique in the French West Indies. His health suffered setbacks during the three years he spent at this task that would affect him for the rest of his life. In a 1773 paper, Coulomb applied his mathematical skills to a number of construction problems using the variational calculus. Some of the techniques he wrote about, including a sliding-wedge theory of soil mechanics, are still in use today. Five years later, he submitted a paper to the Academie des Sciences, reporting research he had done on the magnetic compass using a tortion balance, a device that uses the force generated from twisting a thin thread to measure other forces. For this work he shared the Grand Prix of the Academie des Sciences in 1777. In 1779, Coulomb began work on the construction of a fort in Rochefort. But he also found time to experiment on mechanics, writing "The Theory of Simple Machines," for which he was awarded the Grand Prix. He then turned his attention to researches on electricity and magnetism, submitting an average of a paper a year over seven years beginning in 1785. It was during this time that he showed, using his previously perfected tortion balance, that the electrical force between charged bodies varies inversely as the square of the distance between them, and is porportional to the charge of each, being an attractive force for opposite charges, and a repelling force for charges of the same kind. He also demonstrated that non-conductors pass electricity to some extent. From the early 1780s to the first decade of the 1800s, Coulomb continued to be involved with public life as the turbulent politics of those times permitted. He reported on canal and harbor works in Brittany in 1784, was placed in charge of the King's fountains the same year. He also played a role in ensuring Paris's water suppply. In the midst of the French revolution, he retired from the Corps du Genie, and continued his research from a home in Blois. In 1790, his first son was born to Louise Francoise LeProust Desormeaux, who he would marry in 1802 after the birth of the couple's second son. From that time until 1806, he was, as inspector general of public instruction, instrumental in establishing lycees throughout the country. 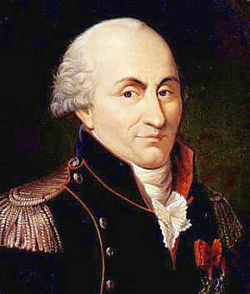 Coulomb, being of ill health in his later years, died in 1806. 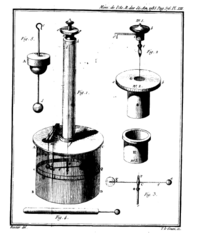 Coulomb is distinguished in the history of mechanics and of electricity and magnetism. In 1779, he published an important investigation of the laws of friction (Théorie des machines simples, en ayant égard au frottement de leurs parties et à la roideur des cordages), which was followed 20 years later by a memoir on viscosity. In 1784, his Recherches théoriques et expérimentales sur la force de torsion et sur l'élasticité des fils de metal (Histoire de l’Académie Royale des Sciences, 229-269, 1784) appeared. This memoir contained a description of different forms of his torsion balance. He used the instrument with great success for the experimental investigation of the distribution of charge on surfaces, and of the laws of electrical and magnetic force. The SI unit of charge, the coulomb, and Coulomb's law are named after him. 8.854×10−12 C2 N-1 m-2 (also F m-1) is the permittivity of free space, also called electric constant, an important physical constant. In cgs units, the unit charge, esu of charge or statcoulomb, is defined so that this Coulomb force constant is 1. The force acts on the line connecting the two charged objects. Charged objects of the same polarity repel each other along this line and charged objects of opposite polarity attract each other along this line. Abbott, David, (ed.). 1984. The Biographical Dictionary of Scientists. New York: Peter Bedrick. ISBN 0195210832. Asimov, Isaac. 1982. Asimov's Biographical Encyclopedia of Science and Technology. 2nd ed. New York: Doubleday. ISBN 0385177712. Ferguson, Pamela. 2002. World Book's Biographical Encyclopedia of Scientists. 8th ed. Chicago: World Book. ISBN 0716676001. All links retrieved February 1, 2017. History of "Charles-Augustin de Coulomb"
This page was last modified on 1 February 2017, at 20:07.